By the end of the week, the biggest meat producer in Europe, German Tonnies, will set up the company in Serbia, the Chamber of Commerce of Serbia (SCC) has announced today. The Tonnies’ delegation has visited today the Chamber of Commerce of Serbia, where it discussed with representatives of the authorized governmental institutions and SCC implementation of business plans. 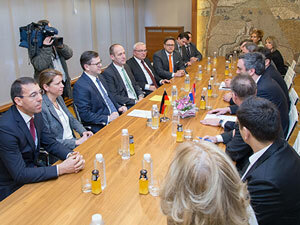 The meeting was also attended by Ronald Zeliger, president of the German- Serbian business association as well as representatives of the Delegation of German business in Serbia. As Marko Cadez, president of the Chamber of Commerce of Serbia estimated, the investment of this company is of strategic importance for recovery of domestic cattle production, increase of technological level, Serbian agricultural competitiveness boost, inclusion of our producers in Tonnies’ chain and increase of Serbian import.